"Fall Trip to the Strip Pits"
What a beautiful start for the Fall Season. Temperature was in the upper 70's, light and variable winds. The roads were dry and the fields had recently been mowed and the hay put up for the winter. No cattle around our pond. This happened to be a weekday, so I was surprised to see another member putting his bass boat on the pond I had selected. With so many ponds to choose from, normally I have the pond to myself. I pulled alongside the member and he asked if I had plenty of room to back my boat into the only boat launching spot on this particular pit. "No problem," I replied, then walked up to him and said "Mr. Youngblood, I presume?" (I had taken note of his name on the sign in log). Call me "KV??" he replied as we exchanged greetings and shook hands. I had seen his name several times before, but never met the man. 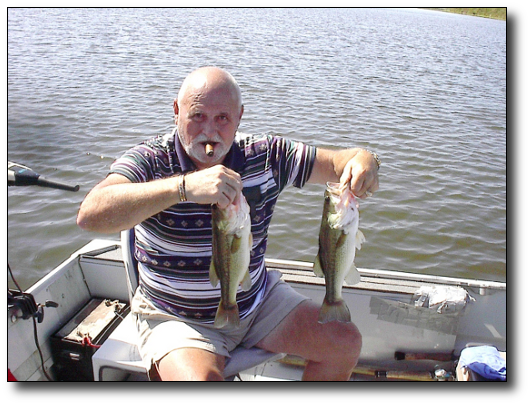 I told him if he caught anything noteworthy, to keep it long enough for me to get a picture. I had to lend him a stringer to make sure the fish stayed alive and was healthy when we released it. Crappie was the last thing on my mind, since I had fished this pit several times this year and while I knew there was some crappie in this pit, so far this year none had taken my bait. It wasn't long after we went separate directions when he hollered at me. "I just caught a nice Crappie." 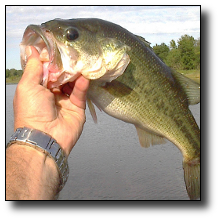 Soon afterwards, we crossed paths and he held up a couple bass. I snapped a couple shots and they were released. While we didn't catch any "significant bass or crappie," we had a great time. Together we probably caught 20 to 25 fish. 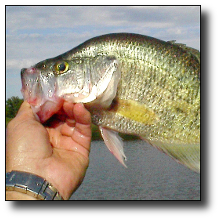 The biggest bass was possibly 3 pounds, the biggest crappie was 13.5 inches. Add to the fact that I was using an ultra-light spinning rig, and those 2 to 2.5 pound bass give you all the fight you want. Those were some healthy fish. So now we are looking forward to the fall turkey season and soon thereafter, deer, the upland bird and waterfowl. I'll be seeing you in the field or on the water!